CATMEDIA Founder and CEO Catherine Downey takes a seat on the Leadership Atlanta Class of 2019. A very successful business executive, Downey has been growing her company since 1997, and will now have the opportunity to offer her knowledge and experience to growth and development of leadership in the City of Atlanta. 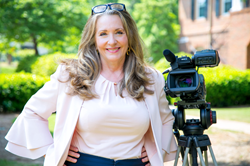 CATMEDIA CEO, Catherine Downey, has been accepted to the Leadership Atlanta Class of 2019. Downey is among the ranks of classmates from numerous Atlanta powerhouses to include Comcast, Georgia Power, Ernst & Young, Coca-Cola, and UPS. The core of Leadership Atlanta's programming is a nine-month, executive-level series, in which 85 established leaders are chosen each year to represent a broad cross-section of metro Atlanta. The goal of Leadership Atlanta is to work together as a network of established leaders to improve and strengthen the City of Atlanta long-term. Leadership Atlanta works to achieve this goal through various retreats, full-day seminars, service projects, discussion groups, and community tours. “I was blown away when I found out I had been accepted into Leadership Atlanta. After attending our orientation, I completely believe this will be a life changing experience,” says Downey. Members of Leadership Atlanta all share in a transformational experience. Through the program’s renowned engagement activities, each member is given a tremendous opportunity to explore critical community issues, examine themselves as leaders, and build relationships of trust and mutual understanding. For more information on Leadership Atlanta’s class of 2019, click here. CATMEDIA has seen tremendous growth since opening its doors in 1997. Not only is the company being recognized as one of Atlanta’s Best and Brightest Companies to Work For for the third year in a row, but CATMEDIA has twice been named to the Inc. 500 list of the fastest-growing private companies in America as well as the Atlanta Business Chronicle’s top ten list of fastest-growing private companies.